Please welcome aboard Mr. Israel Fornelli, our in-house certified gunsmith. 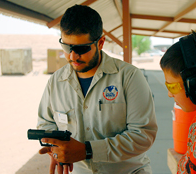 Israel is a Marine Disabled Veteran with in-theater deployment and a vast amount of experience with firearms. He is a graduate of the Colorado School of Trades with a Degree in Gunsmithing. The Colorado School of Trades degree program is one of the most highly respected gunsmithing schools in the nation, where selection is not easy and graduation takes commitment. If you would like to email Israel with a question, you can send an email by clicking gunsmith@tac-safe.com. Guns not performing as expected are extremely hard to diagnose over the phone/counter. It’s best to bring the firearm in and get it tagged for assessment/repair. The gunsmith will inspect, diagnose and call with an estimate for all repairs exceeding $75.00. 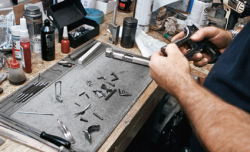 If you choose to NOT have your gun repaired, there will be a $25.00 fee for diagnostics. This fee is waived for guns left for repair.